I will be offering programs throughout 2009 on strategies for getting through this economic crisis. 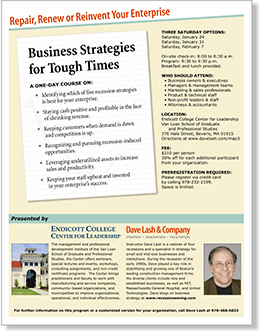 For info on my March 19th half-day seminar at Endicott College Center for Leadership, go here. I'm dedicated to presenting high-value, affordable programs that meet the specific needs of businesses. I'd be delighted to help you think through what your organization might need. Call me at 978-468-6633. It’s all about vision and risk-taking, right? Not so! Exciting new research of highly successful entrepreneurs reveals they follow unexpected, but remarkably consistent and logical patternspatterns you can learn and apply in making your enterprise prosper. Guiding teamwork and communication in the pursuit of creative problem solving is a skill in scarce supply, and distinct from management of normal operations. Loaded with specific methods and templates, Masterful Collaboration maps the best practices of designers and product developers in a powerful approach that can be used by everyone, in any organization. Creating Winning Presentations covers face-to-face as well as online and phone presentations. Probe the 8 vectors of potential business growth and apply a template for taking action. Take the mystery out of financial statements and make better business decisions. Learn the 3 paradigms of information and how to use them to make your operation more effective and efficient. Ten easy techniques for making your communications more impactful and persuasive. Contact us to discuss a workshop for your organization. It's a chaotic world out there! Our programs focus on collecting, clarifying, and communicating the essential data and knowledge needed for more productive business thinking. We offer workshops on entrepreneurial strategy, innovation, and collaboration, along with custom programs designed to your organization's needs. Talks and programs are available in varying lengths, tailored to your audience and industry.